Many Christians are unsure how to respond as racial divisions flare up in America. Three diverse leaders speak from decades of experience on how to do justly, love mercy and walk humbly on race issues. Rev. Samuel Rodriguez (right) hosts a televised conversation on TBN about bridging racial divides with Mike Hayes and Dr. Bernice King, CEO of The King Center and daughter of Rev. Martin Luther King Jr.
As seen recently with incidents in Charlottesville and in St. Louis, racial tensions continue to divide America. 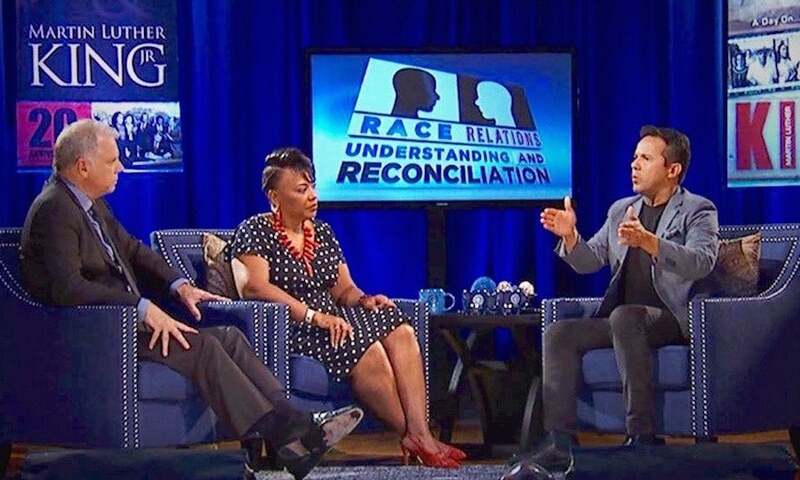 This past week, Dr. Bernice King of The King Center in Atlanta discussed the state of race relations in an hour-long televised dialogue with two evangelical pastors. Rev. Samuel Rodriguez hosted the talk with King and Mike Hayes, who recently moved to Washington, D.C., after leading a Dallas church for decades. The three sought out common ground, believing Christians must lead the way in racial healing and justice. “We still see the absence of the church on these issues,” said King. Has History Been Ignored or Forgotten? The white pastor offered a unique view of the great civil rights leader, best known for leading the 1963 March on Washington for Jobs and Freedom. “Government embraced him,” Hayes continued. “They started changing laws, but you can’t force love.” Bernice King affirmed, “That’s right!” as the diverse crowd listened. After speaking at a church in Memphis, Tennessee, Martin Luther King, Jr. was gunned down on April 3, 1968, at the Lorraine Motel. The site now serves as the National Civil Rights Museum, with the hotel preserved so visitors can memorialize that fateful day. Recent studies of evangelical churches back up these leaders’ concerns. LifeWay Research revealed that 86 percent of Protestant churches are predominantly of one racial group. The study also found that two thirds of Christians believe their church had done enough to reflect racial diversity. 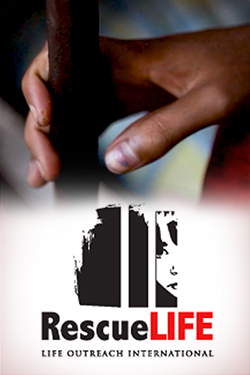 The hour-long program produced by Trinity Broadcasting Network (TBN) includes short segments that illustrate how racism is still present in society today. A pastor related how cops often stop him solely because of his skin color. An investment banker in New York City tells how one client came to meet him after months working together. “This lady literally fainted,” he said, when she found a black man had been managing her money. Others recount similar recent stories. He observed how people tend to stay isolated along political lines, when the church is called to transcend those labels. “The idea of being either-or is wrong and it’s not biblical,” the Hispanic minister said. The three diverse leaders came to consensus, saying that fostering genuine love and respect across racial lines undergirded their efforts. She pointed to the Better Together initiative started by The King Center in April. Atlanta-area pastors who opt in are paired with a pastor of another race, to learn from each other’s experience. Rodriguez praised a similar effort by two members of Congress. Senators Tim Scott, R-S.C., and James Lankford, R-Okla., have been promoting what they call “Solution Sundays” over the past year. “We challenge each family to give one Sunday lunch or dinner for building relationships across race, to literally be part of the solution in America,” the two Senators wrote in a joint op-ed last year. The leaders see hope ahead. Mike Hayes noted many pastors in various Christian streams are starting to preach on race issues. “There’s never been an hour where we have a better opportunity as the Body of Christ to be the answer,” he concluded. One lie from the start, in Charlottesville, someone ran into – NOT the crowd – but into another car while he was attacked by antifa, and a woman had a HEART ATTACK possibly because she was morbidly obese. Hey, lets not worry about actual facts and evidence, the narrative is more important. We had the first black president who served two terms. Screaming racism and demanding repairations at this point is divisive and disingenous. That is why we have Trump. If you scream racism, people will throw cash at you telling you to stop. It is 2017. If you keep removing the bandages and picking the scab then keep claiming to be wounded, but demand I still be a healer when I was the one bandaging the wound, I will call you out as an evil manipulator and moocher. Baltimore, Chicago (how many deaths? ), Detroit, and even Selma and Birmingham are 3rd world hell-holes. Not because I’m not sending them enough cash. How about ending single motherhood in the black community. Star Parker noted how abortion – Molech child sacrifice – is targeted there. It has been a generation since or a degeneration. The “Great Society” has paid blacks to do evil, violate the 10 commandments. They have no familiies (80% born out of wedlock in Detroit). How can you blame me for that? Should I shout the biblical injunctions against sin louder? Or do you just want more money. If you wish to behave like pagan barbarians, the Bible lists the curses you will receive. I can’t and WON’T attempt to stop your depravity, but won’t pay to help you with the curses you inflicted upon yourselves. Scream “racism” all you want. But your actions, your out of wedlock births, your violence, your thefts, speak loud I can’t hear you. And as far as I was there, I was telling you, even screaming at you that you must OBEY the commands of God. That God judges fairly and screaming “racism” won’t work wen it isn’t just. A handful centuries ago did evil. Others arrived after the controversy. But you blame all whites in a reverse racism because they prefer to write checks just to get it top stop, not demand you stop the evil behavior. No more. Go back to God. Have strong nuclear families. Be diligent and industrious. Don’t lie, steal, cheat, or do violence, and throw out those who do. Show that you are MORE righteous than any white area. Then lets talk. I agree with this comment. Racism in this nation doesn’t prevent a brown or black person from living a happy and successful life. I know because I am brown and have experienced racism. Racial healing starts with liberals and dark skinned people ceasing to scream racism, inequality and oppression. Enough already. Our pastor tried to promote racial healing in our church and I was pretty upset. There IS a cultural divide but no racial problems except with some blacks and over educated whites that believe all the liberal brainwashing. Many brown, black and white people groups have been given different gifts from God. They are equally valuable but not equally, smart, athletic, happy or artistic. We are different and like to be around people that feel like our family. When it comes to the church I don’t want to worship with people who preach and sing praises that to me are mindless and repititious. Or if preachers yell the whole message my husband cannot receive the gospel that way. Enough with this racial healing. Stop looking at people’s skin color. Stop accusing all white congregations of being part of something wrong. Stop making people with darker skin victims.!!!!!!! God is no respecter of persons, and if you are in him, and he in you, we are brothers, because we OBEY the same God. God doesn’t give passes. To do any healing, racial or otherwise, we need to bind and close the wound, not keep it open, bleeding, and festering until gangrene sets in. The new pastor at our church is headed down the same foolish road, we left. I resent being told to view people in the context of their skin shade. I view my fellow Christians simply as brothers or sisters in Christ, the shade of skin is irrelevant in God’s eyes so why should it be made relevant in mine? It’s such foolishness and breeds division to drag the worlds junk and language into the church. Politicians thrive by dividing citizens as either ‘white’ or ‘of color’. I cringe when I hear that divisive garbage in the church, and I certainly won’t support it. Heather Heyer, age 32, was a fit young white woman who died standing in solidarity with her black brothers and sisters. The words spoken during her funeral are worth considering. Heather Heyer was morbidly obese. Did you even see one picture of her? Fit? Hardly! Enough! Stop making people with darker skin victims! Stop making a church with fair skinned people a problem. I need to double down. Abortion – which murders 1 in 3 blacks. 4/5 births out of wedlock. Thou shall not kill, but lets not talk about that. Or Thou shall not commit adultery (sexual immorality). If you break the commandments, and don’t repent, barring some final act of grace and murder, you will burn in hell for all eternity. I can’t find “Thou shall not be a racist” in the decalogue (though I consider it evil because it is stupid and foolish). If you kill, steal, or do something to another race, that act breaks the commandment. Who is the greater racst? Those who look the other way as one in three black babies are slaughtered in the KKKlinics and don’t even mention it? Those who would rather not speak up about immorality (much less crime) in black communities, damning them to hell, both on earth, and eternally? Or those who will declare the full gospel and morality, and insist that through the mercy and grace of God, repentance, and the Holy Spirit, they can become as if not more righteous than whites, with the accompanying blessings? Those three are all stooges and I would rather teach SS to 3 year olds than sit down and talk to those guys about anything. I read and reread this particular sentence trying to wrap my head around it. I’ve heard similar before and wonder what actually is meant by expecting pale skinned people to become healers. It’s one of those ambiguous terms that begs to be better defined because frankly most folks don’t know what that is suposed to mean in the minds of those who say it. Every word from the 20 minute point to the end explains what Hayes meant in the statement you reference. For example, a white Christian family intentionally having Sunday dinner with a brown or black family from church; an intentional random act of kindness towards a visible minority…those are samples of acts that move you from being a non-hater to being a healer. As a pale skinned person who is married to a darker skinned person, both of us immigrants from vastly different ethnic groups, turned naturalized American citizens, I’m doing a lot more than Sunday dinner with ‘brown’ people. You see, neither of us is steeped historically in all this “white vs colored”, we just came to appreciate each other as a person, grew in love and committed ourselves to each other in marriage. Our family get togethers on both sides are an ethnic mix from several points of origin and shades of skin. Thing is we’re all just people doing our best to get along like any other American extended family. This is my frame of reference, I could care less what shade of skin people have, I care about peoples charscter, I live it out every single day, it is our normal. And yet a ‘white’ pastor who knows me who peddles this race bait nonsense went so far as to tell me personally I should hate myself because I refuse to regress to his way of thinking. I fully understand there are people of all shades who judge others based on their skin shades and ethnicities. I refuse to swim in that nonsense and it’s terrible discouraging when churches start peddling the same junk in their own way. The way to get to judging people by their character instead of skin shade is to start judging people by their character instead of skin shade. To borrow a shoe slogan.. just do it. As Christ has grown in me my ability to be captivated by the soul inside has grown. I was once very repulsed by obese people but now I see that although they can’t climb the diet and exercise mountain they are wonderful souls. Minority skin color doesn’t make you a victim or a disadvantaged person. That is liberal nonsense. It also shouldn’t make you a trophy. Stop looking on the outside!!!!!!!!!!! Does the outside tell us things, of course but the value on the outside should be eclipsed by what is inside. How much of the 86% of Protestant churches being predominantly of one racial group is due to geography – the local area predominantly comprising one racial group, linguistic – the church doesn’t cater to English speakers, or cultural – caters to specific cultural tastes? Perhaps ‘racism’ is akin to the preference for hymns versus choruses or liberal v Biblical theology. Since race is an obvious difference, and racism is a hot topic for the Left, it’s easy to claim racism where there is none. Case in point. I’ve attended several churches over the years and all have been predominantly one racial group or another. Being majority or minority race was irrelevant so long as the church was Christian. What is the elephant in the room in such a discussion? The definition of racism! According to the left’s narrative (religious and secular), only white people can be racists because they have the power and position in American society. The words “institutionalized racism” in the piece gives this away, and too many well-meaning conservative Christians swallow this assumption uncritically. The sad thing is that it comes right out of the Marxist worldview playbook, with more than a little Nietzsche thrown in. A better definition of racism without all the leftist ideological baggage would be those who are obsessed with race! And unfortunately black people in America have been programmed by our cultural elites to obsess over race, and there, I believe, our true problem lies. What illustrates your point from the video is their attempt to portray the sides of this social issue. KKK and neo-nazis on one side and BLM on the other, completely ignoring black nationalists such as the New Black Panthers.